“Poem (Lana Turner has collapsed! )” is one of Frank O’Hara’s funniest and best-loved poems. With its campy treatment of a tabloid headline about a glamorous celebrity facing adversity, it’s often cited as an example of O’Hara’s embrace of pop culture and his affection for the cinema and its stars. I assume the influential poem even has something to do with the unusual name of the excellent journal of poetry and commentary, Lana Turner, now on its sixth issue (I may be mistaken about that connection, but it’s one I can’t help but make). As the oft-told story about the poem’s origin goes, O’Hara wrote it while he was on the way to give a reading with Robert Lowell at Wagner College on Staten Island. O’Hara didn’t care much for Lowell’s poetry, and as David Lehman tells it in The Last Avant-Garde, “O’Hara regarded the event as something of a grudge match; his close friend Bill Berkson remembers it as a ‘mano/mano’ duel. February 9, 1962, was a cold, snowy day in the city. On the way to the Staten Island Ferry, O’Hara bought the New York Post and on the choppy half-hour ride he wrote an instant meditation on the tabloid revelation that Hollywood actress Lana Turner had collapsed… O’Hara read the poem that afternoon, making it clear that he had written it in transit. The audience loved it; Lowell looked put out.” When it was his turn to read, a peeved Lowell told the crowd that he was very sorry, but he hadn’t written a poem on the way to the reading. Less familiar than this anecdote, however, is the actual incident O’Hara responds to in the poem. Even though I’ve written about and taught the poem for many years, until now I wasn’t really aware of what exactly had happened to Turner on that fateful day in 1962 (and it doesn’t help that this incident has not left much of a digital trace on the web). One neat thing about seeing the actual news item is that it gives one a clearer sense of the severity, or non-severity, even absurdity, of the incident O’Hara writes about — complete with a quote from the scandal-plagued actress’s fifth husband about her “collapse” at her own birthday party. (I’ve written a bit about the poem’s rather complicated stance towards celebrity here, p.115-117). * UPDATE: I’ve altered this sentence slightly after hearing from Terrence Diggory (Encyclopedia of the New York School of Poets), who raised the point that we do not know conclusively that this is the same news item O’Hara saw and responded to in the poem — unlike in “The Day Lady Died,” O’Hara never identifies it as the New York Post. Furthermore, the lines “suddenly I see a headline / LANA TURNER HAS COLLAPSED” seem to imply that he is reproducing a headline verbatim, which does not match the Post piece. So, as Terry points out, O’Hara may have been responding to a different source. 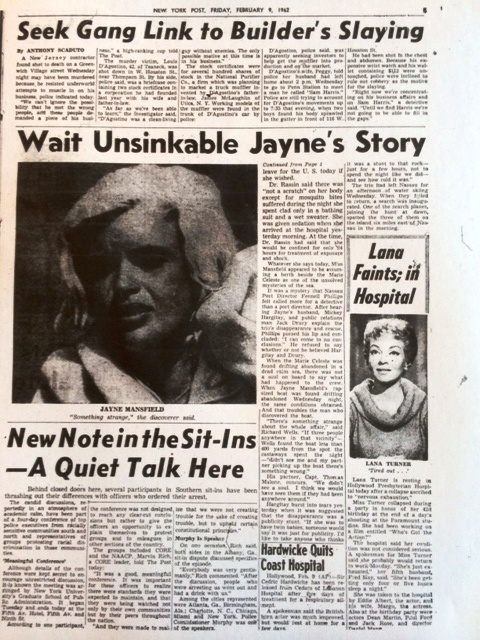 However, not only does David Lehman (above) say that O’Hara had bought a copy of the New York Post on the way to the ferry, but Joe LeSueur’s account of the poem (in Digressions on Some Poems by Frank O’Hara) also states that “Frank was merely responding to a New York Post headline — impulsively, unpretentiously, with humor” (p. 265). LeSueur had the advantage of actually being there with O’Hara on the night in question, on the ferry, and while that doesn’t mean his recollection is correct, it certainly points to the likelihood of this being the newspaper O’Hara read that day. And while O’Hara does say “suddenly I see a headline” in the poem before seemingly reproducing the headline in all caps, the poem seems playful and campy enough that it seems plausible he may be re-casting the headline in hyperbolic terms to play up the absurdity of the original piece. Perhaps that is why he doesn’t include quotation marks around it either. So it’s fair to say that there is no definitive proof that this is the exact news item O’Hara saw, but there are also some good reasons to think it was. This entry was posted in Film, Frank O'Hara, Poems, Robert Lowell. Bookmark the permalink.